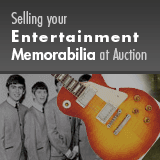 Elvis Presley Signed and Inscribed Photo File With Collection of Vintage Elvis Fan Items. We know the autograph on this late 1950s souvenir photo file is genuine, but someone -- perhaps Elvis? -- changed the name of who it was originally inscribed to! It comes from the collection of Ken Moore, Elvis' head of security at the time, and is made out "To Ken / Elvis Presley." A unique autograph, for sure! Together with a collection of 15 printed souvenir promotional items from the period, and a vintage mailing envelope from Colonel Parker's office (the package sent Air Mail!) with the address label removed. The promotional materials are all in Excellent condition, while the photo folio and mailing envelope are intact, without tears, and in Good condition, with some signs of wear. COA from Rich Consola. COA from Heritage Auctions.